This high-end, laidback resort blends the French flair of Sofitel with the traditional customs of Fiji. Set on a private waterfront location on Denarau Island, this luxury resort is home to the Pacific’s largest lagoon-style pool, complete with a two-story waterslide and man-made islands! Also offering world-class dining, stylish accommodations, a great spa, and a wide array of fun activities – this resort truly has it all. Conveniently located just 20 minutes from Nadi airport, this tropical retreat is also a perfect resort for pre- and post- overnight stays. 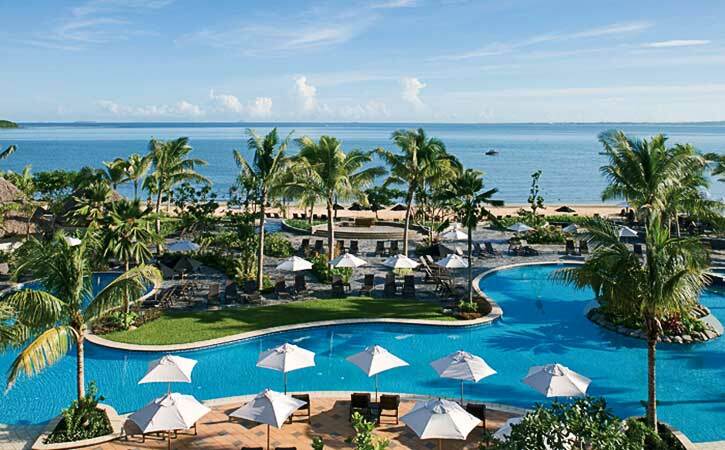 Sofitel Fiji Resort & Spa offers 296 guest rooms and suites, all facing toward the Pacific Ocean with private terraces or balconies allowing for stunning views. All accommodations feature elegantly appointed furnishings with Fijian influences, coffee/tea making facilities, IDD telephone, radio, remote controlled color LCD TV, mini bar, bathrobe, slippers, hairdryer, iron/ironing board, in room safe, broadband internet access, and Pure Fiji amenities. Selected suites offer private outdoor Jacuzzis so guests can enjoy the tropical outdoors without leaving the privacy of their room. 76 Classic Resort View Rooms - Suited for couples or small families. Private balcony area, King size plus a sofa bed. Designed for 2 guests, but can accommodate 3 guests. 180 Superior Ocean View Rooms - King bed and one sofa bed, or one Queen bed and one double bed. 16 Superior Family Ocean View Rooms - Designed for families. Includes one queen bed and one 2-tier bunk bed, ideal for 2 children, and features a combined living/sleeping area. 6 Junior Suites - One King bed and one sofa bed. Features a separate shower and a spa bath on the private balcony area. Designed for 2 adults but can accommodate 2 adults and 2 children. 2 Executive Suites – Separate living room and bedroom. Bedroom features one king size bed, living area provides a stylish, open plan lounge and entertaining space. All suites offer a spa bath. 2 Presidential Suites – Self-contained apartments with separate bedroom and living areas and a generous private and furnished balcony area featuring a private outdoor bath. Bedroom features one King size bed and the living area provides an open plan lounge and entertaining space. Ask us about our current specials at Sofitel Resort & Spa!